The Irish-based Olivier Cornet Art Gallery is delighted to present ‘An Altered Land’, an exhibition of recent works by David Fox, showcasing a selection of the artist’s current painting practice. The show will launch on Sunday 14 April 2019 at the Olivier Cornet Gallery, 3 Great Denmark Street, Dublin 1. Having graduated from Galway’s School of Art in 2011 where he received an Honours degree in Fine Art, Painting, Fox continued his studies and achieved his Master’s degree in Fine Art from Belfast’s School of Art in 2013. The artist now lives and works in Dublin and is becoming increasingly well established as an emerging artist, having had recent and ongoing participation in both group and solo exhibitions. This is Fox’s second major Irish solo exhibition. He has also exhibited internationally, having had three solo exhibitions in Madrid to date. Fox joined the Olivier Cornet Gallery’s Associate Gallery Artist (AGA) group two years ago. ‘An Altered Land’ comprises a series of subdued landscapes demonstrating how man-made constructs have left an indelible mark on our natural world. The artist seeks to push further the notion of human construction, by focusing our attention on these fabricated objects or structures that tend to cut through the land and ‘obstruct the natural world’. We witness a series of roads, bridges and other roadside objects that, not only form key landmarks within the scene, but also form essential constructing elements of the landscapes themselves. Fox contends that landscapes have increasingly become more than a place touched by human presence and more places which are now the creation of human presence. They have become somewhat unnatural. Within each of these paintings we are drawn in by the ‘other world’ like qualities of the ‘man-made’, or human forms that are subtly embedded within the landscape. The viewer is forced to focus on the linear structures cropped within this artificial space. This is a deliberate attempt by the artist to direct the viewer’s attention to the human objects that form the composition and it sharpens the attention on the physical absence of actual human presence, thus creating a feeling of uncertainty and apprehension. The regimented lines of the bridges, road markings, and of the buildings and street lights also focus the viewer’s attention to the absence of the free, chaotic curves and wildness of nature. Throughout his painting practice, Fox documents enticing scenes as witnessed first-hand during his day to day activities. We gain insight to his ‘everyday’ lifestyle, as settings depict the current surroundings of both his professional life and leisure time. In ‘An Altered Land’, a sense of place being most predominant – we witness scenes of empty motorways, countryside roads, rural landscapes and other various works of topography. These mundane and ‘everyday’ landscapes have a stark emptiness that work to create an uncanny representation of the chosen spaces. Each specific painting holds a personal narrative and at the very core, it is a documentation of the artists daily life. While living in Belfast, Fox made paintings of the well-known Peace walls, plus other social/political ‘barriers’ that are still maintained and divide local communities. During this time, he was working part time as a driver and daily trekked from one side of the city to the other, thus gaining great insight to the back streets of the city. 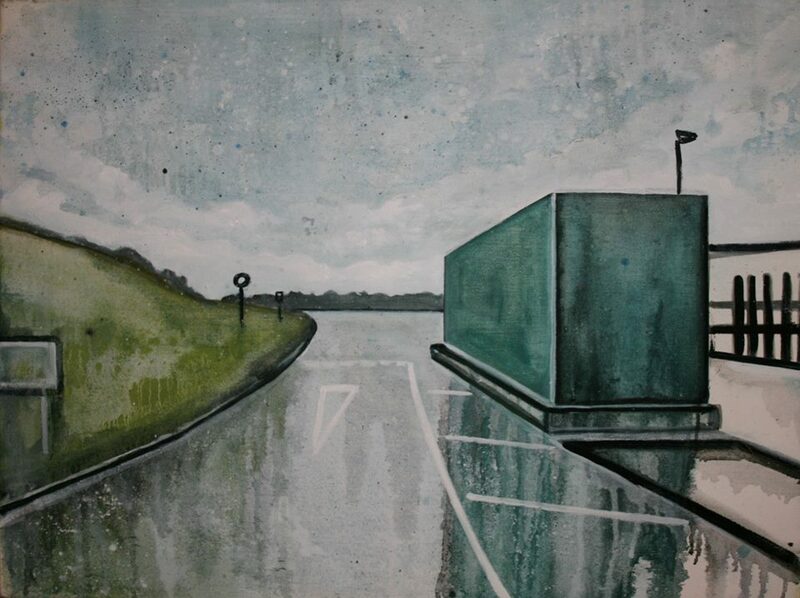 He travelled back and forth from his hometown of Tullamore, inspiring some of these desolate motorway and road scenes. Also, frequently travelling through the Irish border, he then began documenting various border crossings. These works intended on highlighting the vulnerability of an intangible frontier now challenged by an uncertain future. As is also evident in these paintings, the artist has a love of the great outdoors. As a frequent traveller, he often spends down time exploring rural Ireland, often hiking mountains, country walks, or other various leisure activities. The above subject matter is concurrently bound by the portrayal of the sublime yet emblematic depiction of a commonplace – which then becomes uncanny. Each work takes us through a passage of both place and time, whilst primarily exploring the notion of a journey that is without end. In juxtaposition, these works are a visual diary of uninhibited roads and subtle landscapes of rural Ireland that details the daily life of a venturous artist. Each work evoking a memory, reminding us of individual journeys or experiences we once encountered in the past or throughout everyday life. The above subject matter concurrently bound by the portrayal of the sublime yet emblematic depiction of a commonplace – which then becomes uncanny. Each work takes us through a passage of both place and time, whilst primarily exploring the notion of a journey that is without end. In juxtaposition, these works are a visual diary of uninhibited roads and subtle landscapes of rural Ireland that details the daily life of a venturous artist. Each work evoking a memory, reminding us of individual journeys or experiences we once encountered in the past or throughout everyday life. Cinematography also plays a major role in this work. Fox is mostly influenced by methods used by film directors in the introduction of space to their audience. The audience’s understanding of space is dictated and limited by a set number of camera angles and lighting which make up a film’s image stream which is a composed experience similar to that of a painting. He takes inspiration from film stills associated with a suspense, being created by the cropped symmetrical compositions set by the cinematographer, which in turn work to create a thrilling atmosphere. Looking at this method, the artist then makes paintings which work to charge space with a sense of suspension and the unknowing. Fox has taken a particular interest in the road and motorway scenes witnessed in various iconic movies from thriller genres. Specifically, taking inspiration from the well shot, camera work of such directors as Stanley Kubrick and working directors such as Steve Queen and the Coen Brothers.From this scrutiny of the moving image, Fox uses the stillness of the photographic image to capture the settings that suggest these cinematic merits. The photograph is then a tool, solely used as a map to provide the setting, which then translates into paint. Through the process of applying paint, the artist charges work with atmosphere which seek to describe, and yet limit, the materiality of the space itself.